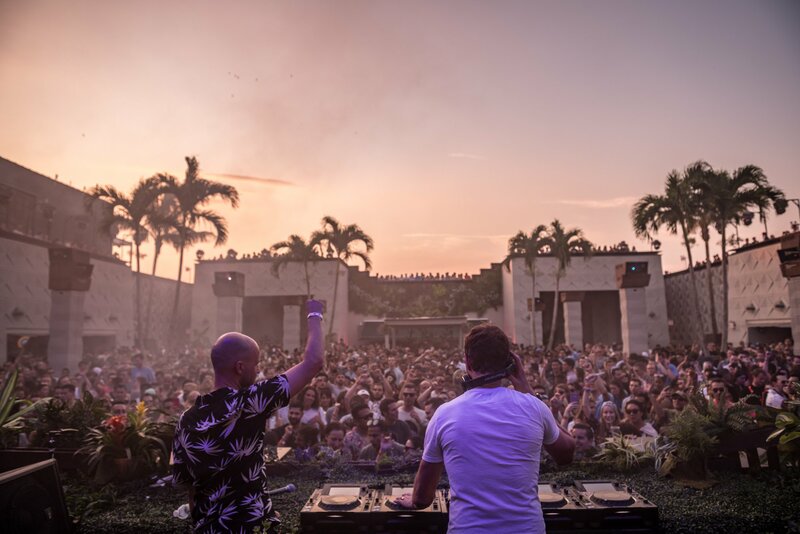 The energy at the Brooklyn Mirage was on another level this past weekend. With a sold-out show, Anjunadeep Open Air went hard in the rain all Saturday evening into the early hours of Sunday morning. Opening doors at 5pm on July 14th, 2018 Anjunadeep had a packed line up for Anjuna fans piling in for the long-awaited New York City show. With the unique skyline of the city that never sleeps, we couldn’t have asked for a more perfect venue for this hand-picked selection of talent. Kicking off the night with the sun still up was a live set from Ben Bömer and Eli & Fur warming up the crowd for the creator of Anjunadeep himself, James Grant & Jody Wisternoff. James Grant, along side Above & Beyond started the Anjunadeep label back in 2005 as an independent record label based in London. Thirteen years later, the label has taken the country by storm; bringing in fans from all over the world for one of the dance music worlds’ most respected musical creations. As the sun began to set, 16 Bit Lolitas and Luttrell had Brooklyn dancing like no tomorrow. With everyone’s hands swaying to the melodic tunes we welcomed in the nighttime artists still to take the stage. Kicking off Sunday hours was Finnish DJ Yotto, deemed a “man of many sounds” by Billboard. Catching James Grants’ attention back in 2014, Yotto has been releasing a string of originals and remixes we all love to dance to. Picking up the tempo and bring his melodic deep house sounds, the crowd was having a blast. As if the energy wasn’t already through the roof, mother nature decided to join the party as well. Starting with just at drizzle, fans embraced the sounds and rain as it turned into a downpour. Yotto kept bringing the beats and we couldn’t have described the happiness on everyone’s wet faces looking around. Drop after drop, both rain and bass, this was what everyone came to experience. Carefully planning his set, Yotto timed it out leading up to his patiently awaited album “Hyperfall” released just today. After Yotto’s rain set, the man everyone was waiting for finally took to the stage at 1:30 AM. American DJ and musician, Lane 8 brought the groove as the crowd was drying off from there rain dance just moments ago. Being a part of both Anjunadeep as well as his own label, This Never Happened; Lane 8 threw down his talent and gave Brooklyn Mirage his all. It was impossible to stand still with hit tracks, “Duchess,” “March of the Forest Cat,” “Sunlight,” as well as his remix of Mat Zo’s “Superman,” and RÜFÜS’ “Innerbloom.” Taking a glance around, all three levels of Mirage had the pure look of happiness on their faces. Grins from ear to ear and looks of pure enjoyment can be seen in the Brooklyn fortress. With four walls enclosing the massive venue, projectors displayed beautiful visuals and colors for all to enjoy. Ten hours into Anjunadeep Open Air in New York City, we weren’t done just yet. Saving all the talent for the early hours of Sunday, Dusky took the stage as the final performers of the long-awaited event. This talented duo from London took the stage with their unique sounds of jazz influenced deep house and techno by storm. Previously known as Solarity, the duo had only the true Anjuna fans left after the rain and at 3:00 AM. Track after track, there was no signs of the music or dancing slowing down. As the well-recognized sounds of S. Mendes’ “Magalenha” began to resonate, the crowd began to dance even harder, which we didn’t think was even possible. Dancing into the night, fans can feel the drops of another storm beginning to sprinkle into the lights and sounds coming from Mirage. Anjuna fans welcomed in yet another downpour as the music continued well the early hours of Sunday. Finishing off the final act at 4:30 AM, Dusky had finished off NYC’s finest and most fun events of the summer, so far. The rain, the music, the venue, the view, the crowd; we couldn’t have asked for a better night and will remain a favorite to many, from what we hear.